Paper Yak: How to: Patch Jeans! One thing I can't stand is jeans with intentional rips in them. When my jeans rip, it really bugs me so why would you pay for pre-ripped jeans? I don't get it. Anyway, as it happens, all my jeans are old but what I've found helps them last much longer is patching the high wear areas when you get a rip. Normally my jeans rip at the top of the thighs but they'll wear anywhere that is a high friction area or under frequent pressure. One pair has ripped just under a pocket at the front as that's where I hike them up! Anywhere near the top of the legs or the zip/bum area is really easy to patch on a sewing machine very fast. Lower in the leg is more difficult as the arm on a sewing machine will only go down the leg so far. You'll understand if and when it happens! So this is how you fix your jeans with a sewing machine. Get a piece of denim that matches your jeans and cut it a bit bigger than needed and turn your jeans inside out (as seen above). I make up my "denim bag" out of old jeans that don't fit or are stained or I don't wear any more and I cut them up (straight down the seams) for patching my newer jeans! Pin the fabric over the holes. With your hand inside the jeans to make sure the fabric doesn't catch up, tack through the fabric around the hole (leave a few cms gap around) with a bright thread. Normally I go for a bright red thread so it shows up nicely, but I have run out so bright blue it is! Turn the jeans inside out and put under your sewing machine, making sure none of the fabric or jeans are caught up in the tread under the foot. Sew over the tacking stitches in a small running stitch. 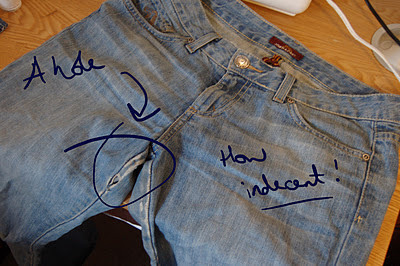 If your jeans are light, use a white or cream strong cotton thread. If your jeans are dark, use a black cotton thread. Make sure it all lies flat and tie off the ends. Trim the excess fabric. When you wash your jeans again, the patch will relax and naturally fray a bit, but it shouldn't fray enough to break the stitch line so don't worry! Unpick the tacking thread and admire your handywork! That looks terrible! 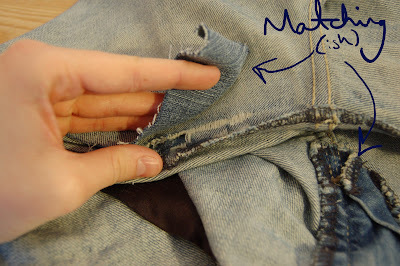 People really patch holes with threads visible on the outside?! I find that iron on patches never stay on properly, so I prefer to sew patches on my jeans as it also gives a softer finish against your legs. I used white on this patch as it was an example (i.e. I wanted the camera to see it) but it's not visible when they are on as it's under your leg. It doesn't bother me but when I patch other people's jeans I normally choose blending thread colours (there's a good tutorial on Did You Make That? if you're interested). You can also patch with some inside pocket material to get a really seamless patch.